Microsoft is continuously polishing their OneNote Windows 8 App to give more user experience. In the series of many enhancements, Microsoft brings the new feature that will please many users who have access the OneNote app in their touchscreen Windows 8 tablets or Laptops. Many of our users expressed the need to be able to draw on the touch devices that do not ship with a pen. With this update to OneNote for Windows Store, now you can draw with your finger! You may know that OneNote is the app from Microsoft to take notes that to save to the cloud. So that you can access it from any devices like Windows Phone 8, Windows Desktop. 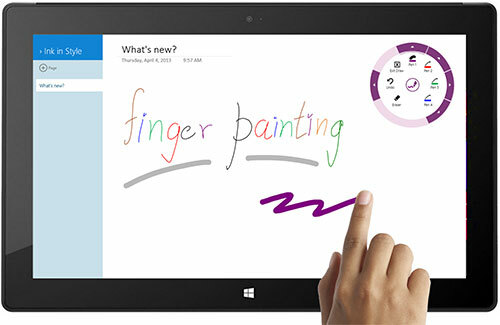 The OneNote app is reimagined for their new Windows 8 Operating system. Apart from typing, you can draw click, or swipe, this app to take notes. Also, You can take pictures to add in to the notes and have the option to share your notes to your friends. Since Windows 8 is developed to target mobile computing users. Microsoft has released the new surface Windows RT tablets and many popular brands like HP also have introduced many Windows Tablets. Though many of the touchscreen devices doesn’t come up with touch pen to type or draw in their devices. Especially to draw your need touch pen to get perfect drawing. So that Microsoft has added this new Finger to Draw feature in their OneNote App, after many of the users demand. To access this feature, Simply tab the Radial menu in the app and select ‘Draw’ option. There you go! You can be creative now to choose pen colors, customize your thickness, and store these combinations as a ‘favorite’ pen. Once you have finished the drawing, just tab the ‘Exit Draw’ menu. If you don’t have the Touchscreen device, you can still use this feature using your Mouse. To download this update, simple go to the Store app in your Windows 8 and click or tab updates. If you haven’t installed this app before, you can download it from App store.